Arguably the best sports team ever assembled, the 1992 USA Basketball "Dream Team" crushed the rest of the world and claimed Olympic gold in Barcelona. The new Olympic professionalism rules had just been overturned and that meant the United States could send an amalgamation of superstars to the bright Mediterranean coast of Spain. By no one’s surprise, the gold medal game against Croatia wasn’t even close. Team USA cruised to a 117-85 victory. 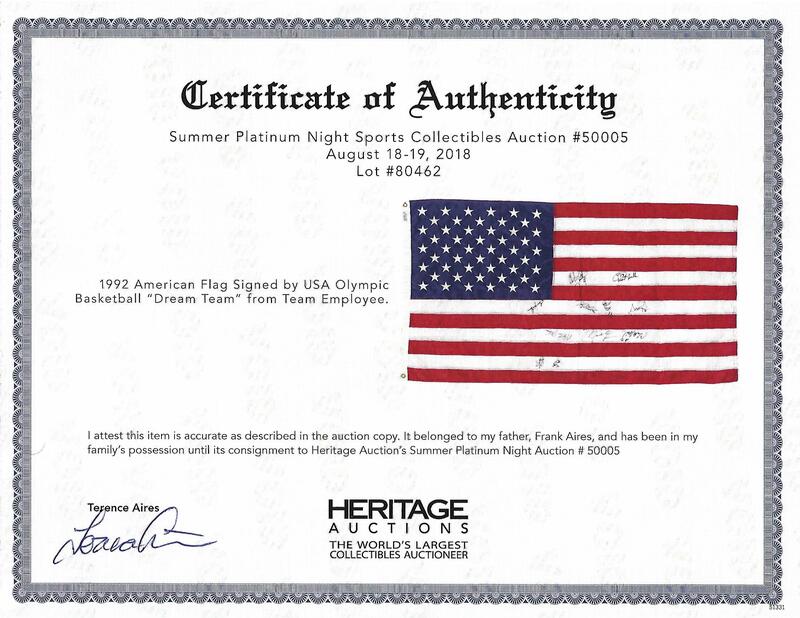 This American flag originally belonged to Frank Aires, a staff member for the team in Barcelona. Images of his 1992 Olympics badges are visible on a previous listing, but the Aires family wished to keep them. 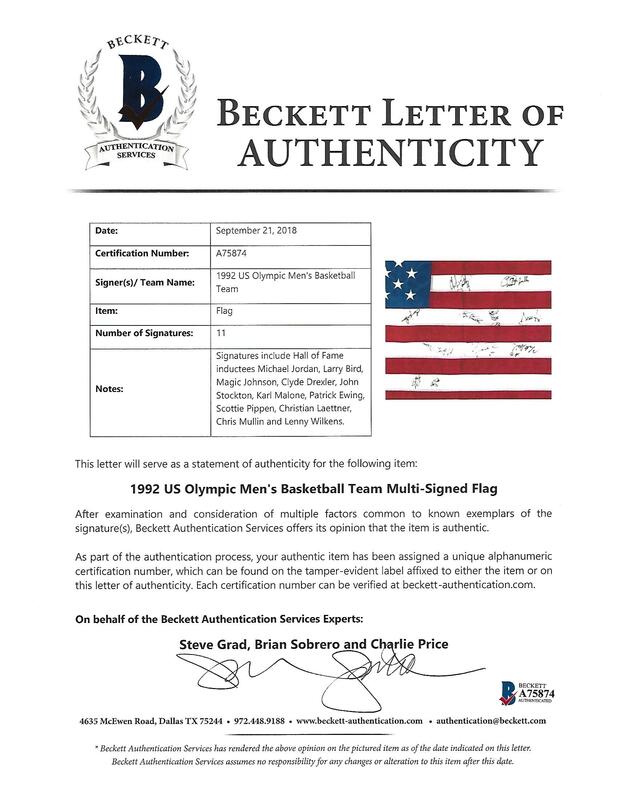 The 32" by 60" flag has been autographed by eleven members of the gold medal group: Jordan, Magic, Bird, Stockton, Ewing, Mullin, Laettner, Malone, Drexler, Pippen and assistant coach Lenny Wilkens. The only player missing is Barkley. All autographs are inked in black sharpie rating 9/10 or better. The flag itself is in immaculate condition and provides the ideal canvas to showcase the greatest basketball team ever. 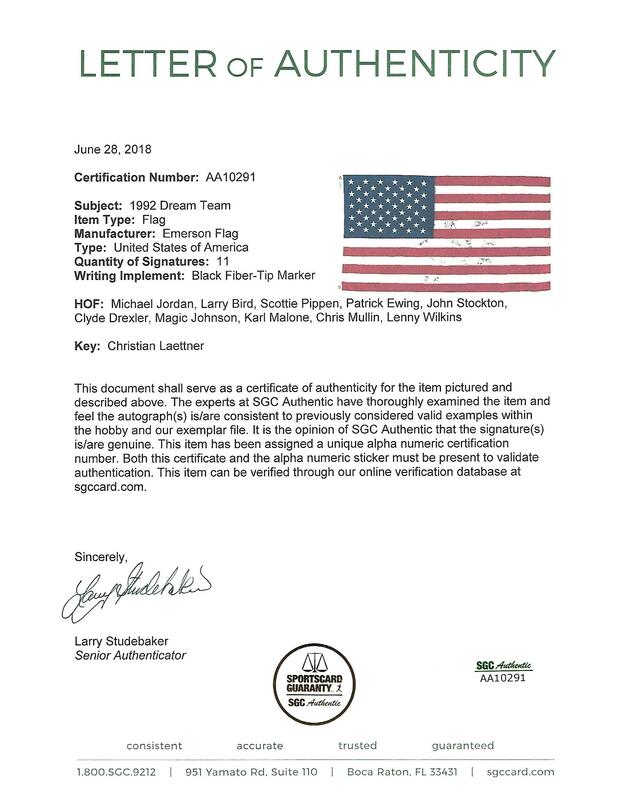 Includes letter of provenance from USA staff member Frank Aires' son. LOAs from Beckett and SGC for the autographs.